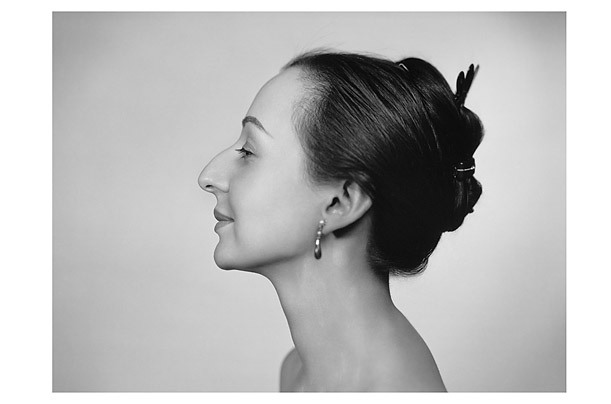 There are plenty of familiar faces at the Yousuf Karsh retrospective at the MFA. conversation. Just a nice day together, which I'm sure the parents among you will appreciate. We had a nice lunch at the museum's mid-casual cafe between the excellent Assyrian show and the promising Karsh photoretrospective. We sat next to a striking older woman I was sure I had seen someplace before. She was eating with a younger woman (perhaps my age) who kept thanking her profusely for something (we could not hear what). She personalized a catalogue from the Karsh exhibit and Cole glimpsed the name Karsh in the signature (we were sitting that close). Later, after the nice Rachel Whitetead installation, we took our time and took a quality look at the Karsh show. After all the famous portraits--Einstein, Jackie-O, Mother Theresa, we saw one that positively made our jaws drop: his widow Estrellita, the woman from the cafe! It was only then we noticed every piece in the show was "courtesy Estrellita Karsh." That explained some things. I love it when I catch a personal glimpse at the invisible bonds that tie the universe together, an artist's version of "dark matter." I love to witness capital moments and I love it when some instinct alerts me to that moment's importance. It was cool that I was able to share that moment with someone who knew how to fully appreciate it. On a wonderful day that was the best part of the holiday weekend, that moment was the highlight, the beating heart that sent the blood of inspiration coursing through my soul.